Much has been written about eighteenth-century automata, and of the history, culture and language of interaction between man and machine in the West. Japan’s love of robots lies in the history of the ‘Karakuri Ningyo’. Until now there has been little interest from outside Japan regarding the Karakuri Ningyo craft, and its influence on technology and the arts. The Japanese Karakuri puppets utilise subtle, abstract movements to invoke feeing and emotion. There are three main categories of Karakuri. ‘Butai Karakuri’ are puppets used in the theatre, ‘Zashiki Karakuri’ are small and can be played with in rooms and ‘Dashi Karakuri’ puppets perform on wooden floats used in religious festivals. Traditionally Karakuri appeared in religious festivals, performed re enactments of traditional myths and legends and entertained the public with their sophisticated, symbolic and graceful gestures. The Karakuri tradition of invisibly concealing technology extends beyond puppetry and robotics, and continues to manifest itself in popular culture. Karakuri influenced the Noh, Kabuki and Bunraku theatre arts and directly contributed to the industrial modernisation of Japan. During the Edo period Japan was completely isolated from the rest of the world, during which time a unique cultural heritage developed away from outside influences. Despite isolation, Western technology was uniquely adapted to produce Karakuri Ningyo puppets. (SUEMATSU 2001b) Essentially, Karakuri is the realisation of the symbiotic relationship between Eastern tradition and Western technology. 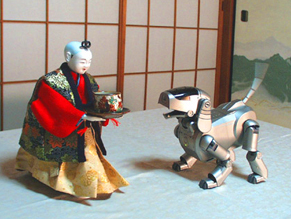 (KUROKAWA 2001) The history of the Karakuri Ningyo highlights anthropomorphic approaches to sociable robot development, and how they differ between the East and West. It is the starting point from which Japan's love of robots and technology has developed. SUEMATSU, Y., 2001b. The Japanese Love of Robots lecture 3, Edo Karakuri Masters were Universal Scientists, Department of Electronic-Mechanical Engineering, Nagoya University. KUROKAWA, K., 2001. The Philosophy of the Karakuri chapter 11, The Philosophy of Symbiosis from the Ages of the Machine to the Age of Life [online]. Available from:http://www.kisho.co.jp/Books/book/chapter11.html [Accessed 10 August 2003]. LAW, J. M., 1997. Puppets of Nostalgia. Princeton: Princeton University Press. All rights, including copyright, in the content of these web pages are owned or controlled for these purposes by Kirsty Boyle. All images and text are copyright unless otherwise noted. These images are not in the public domain. You are not permitted to copy, broadcast, download, store (in any medium), transmit, show or play in public, adapt, create derivative works from or change in any way the content of these web pages or any portion of it for any other purpose whatsoever without prior written permission. Copyrighted images, articles, and other borrowed content remain the property of their respective owners. No copyright infringement is intended or contained on this site. Every effort has been made to identify and credit the original source of all content, but mistakes are inevitable. If you have a question or complaint about any of the images or other content on this site, please contact me.